An incisive examination into the pairing of psychology and situation that creates despotic leaders. Not everyone can become a tyrant. It requires a particular confluence of events to gain absolute control over entire nations. First, you must be born with the potential to develop brutal personality traits. Often, this is a combination of narcissism, psychopathy, Machiavellianism, paranoia and an extraordinary ambition to achieve control over others. Second, your dangerous personality must be developed and strengthened during childhood. You might suffer physical and/or psychological abuse, or grow up in a trying times. Finally, you must come of age when the political system of your country is unstable. Together, these events establish a basis to rise to power, one that Joseph Stalin, Adolf Hitler, Mao Zedong, Saddam Hussein, and Muammar Qaddafi all used to gain life-and-death control over their countrymen and women. It is how Osama bin Laden and the leaders of the Islamic State hoped to gain such power. “Getting inside the heads” of foreign leaders and terrorists is one way governments try to understand, predict, and influence their actions. How can we explain these urges to dominate, subjugate, torture and slaughter? Though these men lived in different times and places, and came from vastly different backgrounds, many of them share similar, abnormal personality traits and, in some cases, mental disorders, including “The Dark Triad:” malignant narcissism, psychopathy and paranoid personalities. 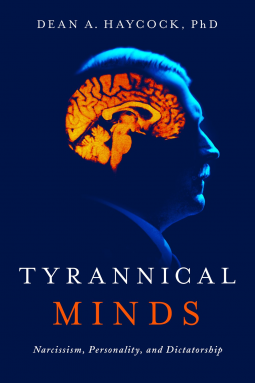 Tyrannical Minds reveals how recognizing these traits can provide insight into their motivations and actions, potentially allow us predict their behavior—and even how to stop them. About the Author: Dean A. Haycock, PhD, is a science and medical writer, who earned a PhD in neurobiology from Brown University and studied at The Rockefeller University in the laboratory of Nobel Laureate Dr. Paul Greengard. He has been published in many science publications and is the author of Murderous Minds: Exploring the Criminal Psychopathic Brain and Characters on the Couch: Exploring Psychology Through Literature and Film along with several other books.